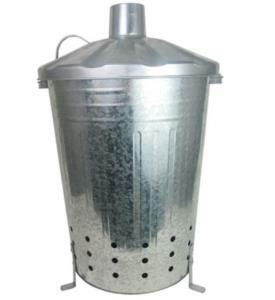 This Galvanised Garden Incinerator has a capacity of approximately 80 litres. It has side holes and a chimney for efficient burning, and comes with legs to raise it off the ground. The galvanised metal ensures it can withstand high temperatures, and can be left outdoors without fear of rust. Ideal for burning garden and household rubbish and is a great way to dispose of confidential waste. Please select collect from shop in delivery options.